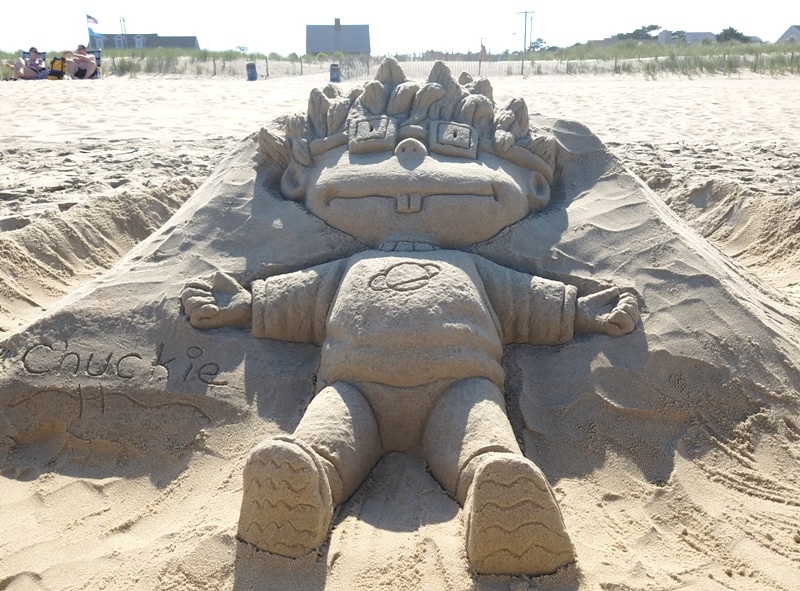 Jim Cook, Dover resident and chemical engineer turned-Rehoboth Beach sand sculptor, has been on the beach much of the summer near the surf’s edge at Rodney Street creating new sand sculptures! Some of his recent works include: Angelica and Chuckie from Rugrats, Squidward and Plankton from SpongeBob, and Peggy Pig. Here’s Chuckie! “That’s part of the fun I’ve had over 25 years doing over 400 different things,” he says. “I know I could speed up my process and probably improve my outcome by using other tools… but, my primitive method works for me. And part of the fun is meeting and seeing so many nice people who stop by and take pictures during the day… adults and kids. I’m glad my sand art can be part of their Rehoboth vacation experience,” he adds. 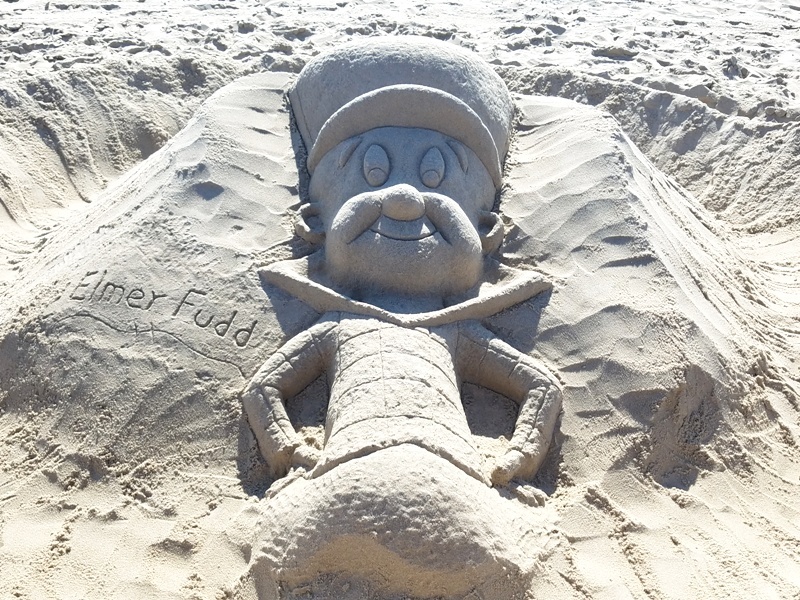 He only does sand art on days when the weather and wind cooperate but he does not mind the heat. “Since I carry about 1500 pounds of water in making a large sculpture… I am in and out of the ocean a lot… and keep cool over the 10 to 12 hours I spend on them,” he points out. 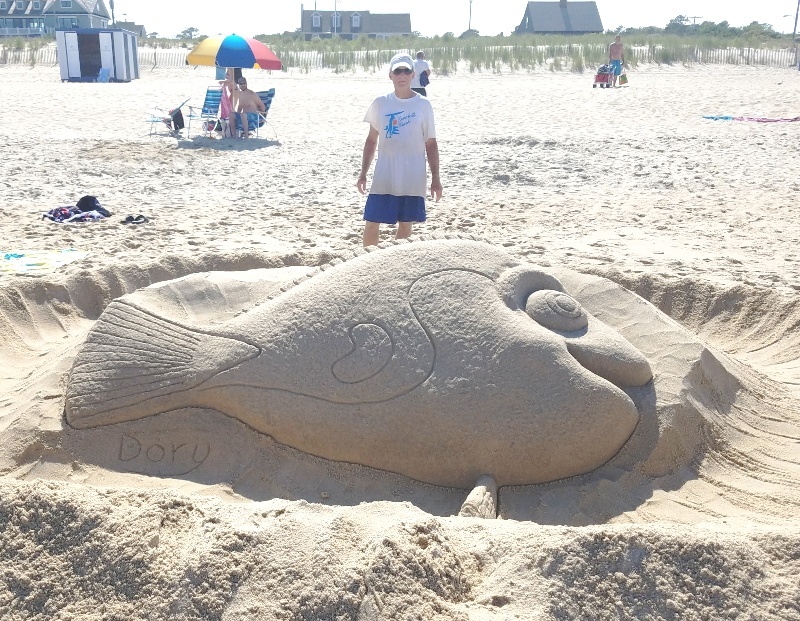 This is another one of his recent sand artworks: Dory from the movie: Finding Dory. Cook often poses with his sand artwork to simply give it perspective as to its size. Cook typically begins the building season around Father’s Day and creates between 20 and 25 objects through around Labor Day. He says he usually starts off doing small works and expands from there — as he builds his stamina. So look for him and his latest artworks on Rodney Street in Rehoboth!